What an amazing few days in Geraldton! Despite not getting the four points, the football showcased in our Midwest zone throughout the week was hugely successful. 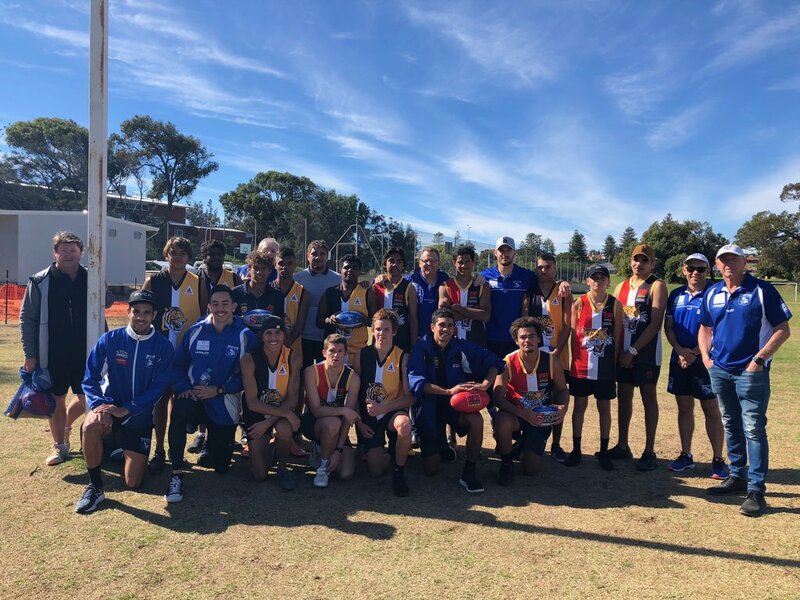 It all started on Wednesday when East Fremantle’s Talent Manager Mark Pashby, 16’s Academy Head Coach Larry Cavallo and EFWFC League player Steph Sparke, took a large number of young men and ladies through their paces with a clinic. The response to female football in the region has been outstanding, with 40 girls turning up. 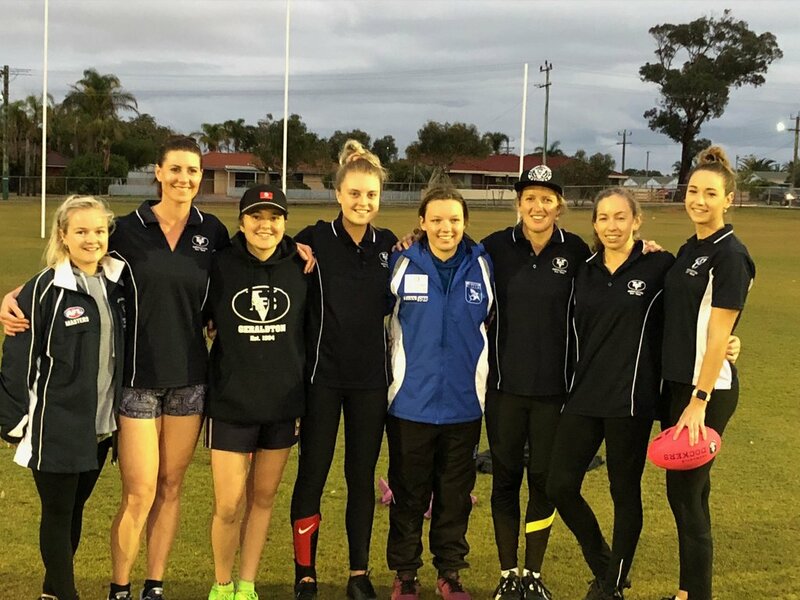 A huge thank you to the seven girls from the Railways Women’s Football Club for assisting Steph with coaching and congratulations for taking out the inaugural GNWFL grand final! One local product who wasn’t able to get up on the Friday, Kimmy Schofield, joined the rest of the squad and staff Saturday morning. Kimmy’s debut is an amazing example of the football pathway in action! A great achievement for everyone involved. He joined brother Jayden for the very first time on-field, no doubt a great experience for the Schofield family. Kimmy was presented his debut jumper by no other than Leith Teakle, a local lad and Life Member of the Sharks, after playing 166 games in the Blue and White. Upon arriving at the very large Wonthella Oval (WA Country Builders’ Stadium) game focus was on. Unfortunately, the Sharks, who started well, couldn’t get scoreboard pressure and when Claremont got their chance they took it. 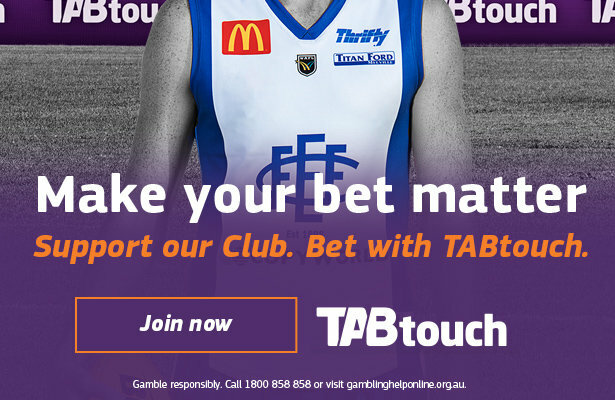 An error riddled first half saw East Fremantle head in to the main break staring down another potentially large loss, trailing by 44 points. However, to the credit of both the coaching staff, who made several moves and the players, a fired up East Fremantle fought their way back in to the contest, showing determination Rob Wiley had been hoping for in season 2018. The Sharks kicked 6 goals for the quarter and could have been even closer than the 26-point deficit they faced at the last change. The final quarter was a fierce contest, but unfortunately the Sharks couldn’t make the most of their chances, bridging the gap by 6 points. 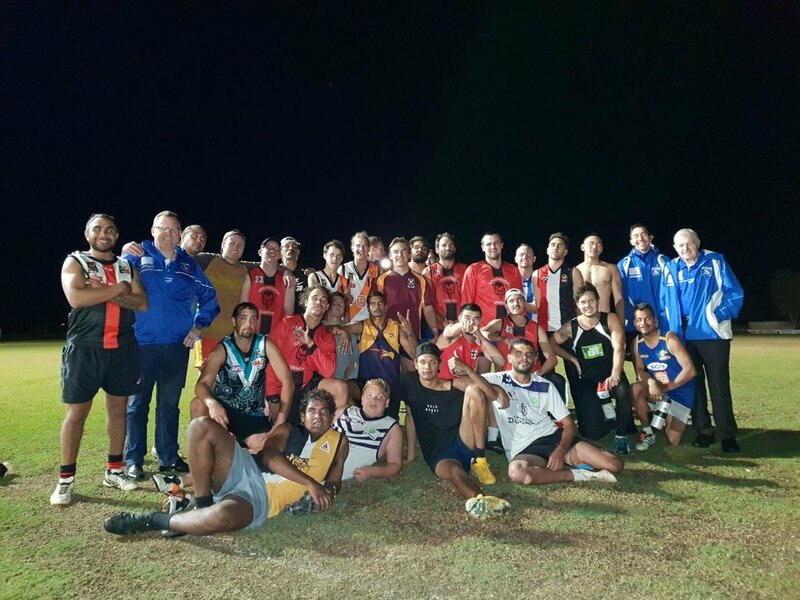 On Sunday morning, prior to heading back to Perth, the team took part in a clinic for school kids out near the Brigades Football Club. Plenty of people put in a huge amount of work to ensure events such as the country matches run smoothly, particularly our team in the Midwest. To Colin Cox, the GNFL Board and their organising committee, well done on for putting together an outstanding venue and set up throughout the week. To Grady Tomelty, Kristian Dicton, Brent Sheriden and Kane Benson for their tireless work over the past few months to ensure the community engagement was well organised and received. Craig Walker has shown passion for the East Fremantle/Midwest partnership and his involvement and support is greatly appreciated. To Kandi Cullen, her father Allan and all at the Towns Football Club for providing an amazing venue for the clubs to play at, along with Rovers Football Club who provided the players, staff and officials a wonderful post-match dinner Saturday night. Thanks also to Cameron Knapton and Luke Sanders for their work in the lead up and especially to Luke once everyone got in to Geraldton for the match. If you are looking for a place to stay be sure to check out The Gerald. Their hospitality and desire to ensure the travel party had an enjoyable stay was first class. 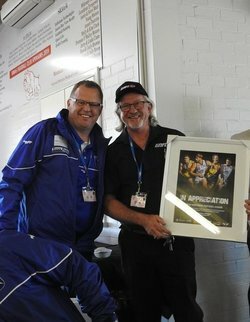 EFFC Supporters Trip a Success! 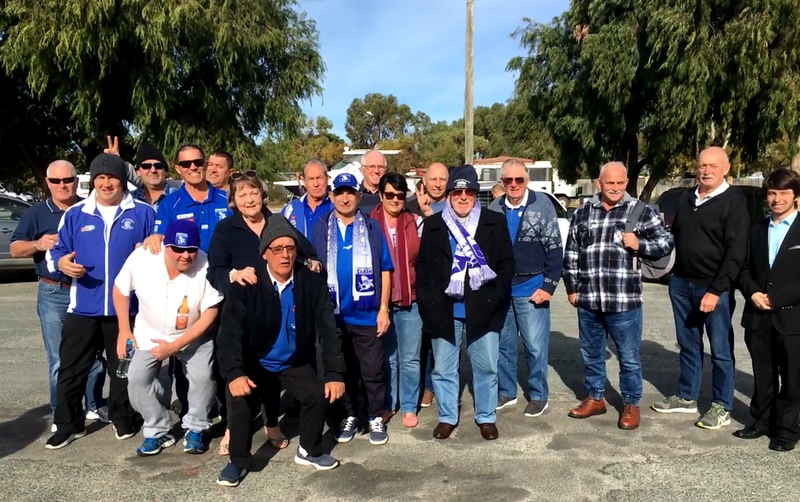 An awesome time was had by all who travelled on the EFFC supporters bus to Geraldton. They cannot wait for the next time the club is invited to play a match in the country area. George Strnadica, Vic Strnadica, Paul Leonard, Jesse Dart, Jeff Bennett, Lyn Barrett, Kaye Shields and Bill Cronwell. Bill also made and supplied the match ball stand which will be signed by each player and placed in Towns Football Clubs glass cabinet. Thanks once again to all the sponsors of the bus: Jurien Bay Hotel, Jurien Bay Bakery, Geraldton Beach Hotel, Geraldton Hotel, The Bunch Café Geraldton and of course Horizons West Bus & Coachlines. A huge thank you to Cass Rowe for organising the supporters trip!